Bobby Haas is a bike collector, author, Nat Geo photographer and ex-financier who is currently working hard on his latest endeavour, the Haas Moto Museum in Dallas. He owns five Hazan bikes amongst 160 others and when he’s not bidding at moto auctions, he likes to write. As a guy who knows more than most on the joyous cultural phenomenon that is motorcycling, we asked him if he would write for us; this is the result. As I stare, white-knuckled and barely breathing, at the trucker unloading the famous three-cylinder 492cc Seeley-Tait customized racer that I managed to capture at Bonhams Spring Stafford Sale, the thoughts that ricochet through my mind, strangely enough, are thoughts of love … how love is a long and winding road with potholes and loose gravel that add intrigue to an otherwise pedestrian journey. 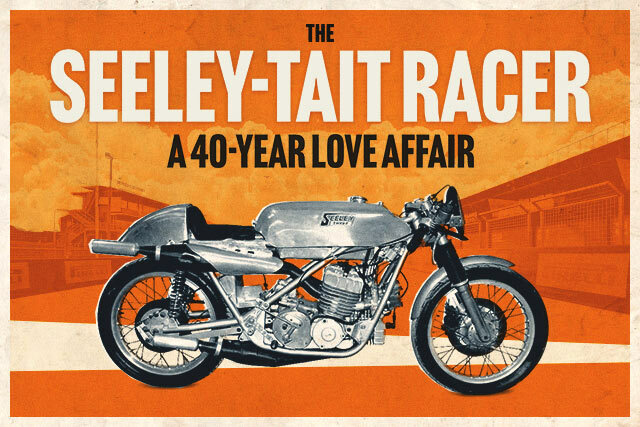 Bob Tait, the British designer and builder of this magnificent Seeley-Tait racing machine that was about to put down roots in its permanent home at the Haas Moto Museum, understood that bit of advice about as well as any custom builder who ever donned a welding helmet. The 5100-mile trek that his one-of-a-kind racer had just taken “across The Pond” from England to the States was a casual stroll compared to the 40-year odyssey that his creation had taken from the moment when its engine was first unveiled at the Earls Court Motorcycle Show in 1967 to the day, 40 years later, when Tait attached a Colin Seeley frame to his home-built triple. True to the admonition of the fellow in the saloon, Tait gave up at one point in his love affair with this racer—frustrated at his inability to perfect its steering, Tait “left the stadium” for no less than 30 years with the engine stashed away in boxes. Before leaving the stadium, however, Tait went so far as to carve his original frame into pieces, an act of mutilation that brings to mind the slicing off of an ear lobe by the legendary, but tormented, painter Vincent van Gogh. It is sobering to reflect upon the fact that all the magnificence of van Gogh’s timeless work was fashioned within a life that spanned only 37 years … three less than the elapsed timeclock on the 40-year Seeley-Tait project. In the course of my comparatively fleeting journey from acquiring my first motorcycle in late 2014 to the opening of The Haas Museum in April 2018, it has been my privilege to work with a handful of the finest custom builders alive today—Max Hazan, Craig Rodsmith, Walt Siegl, Bryan Fuller, to name just a few. And it has been my experience that even the great ones know full well that the passion that infuses every morsel of their creations (and countless other attempts that never escape the scrap heap of abandoned projects) is an incurable addiction to the chaotic, meandering process of producing bespoke motorcycles. It is an affair that is messy and risky and pockmarked with frustration, grime, and self-doubt. It is indeed a love affair you cannot pursue from the sidelines—you either get on the field or you leave the stadium.